A new cultural centre lines the western edge of Longcheng Plaza in the Longgang district, one of the largest suburbs of Shenzhen. Designed to revitalise this park-like square, the complex comprises a vast bookshop, museum for art, youth centre and science centre spread over four volumes. 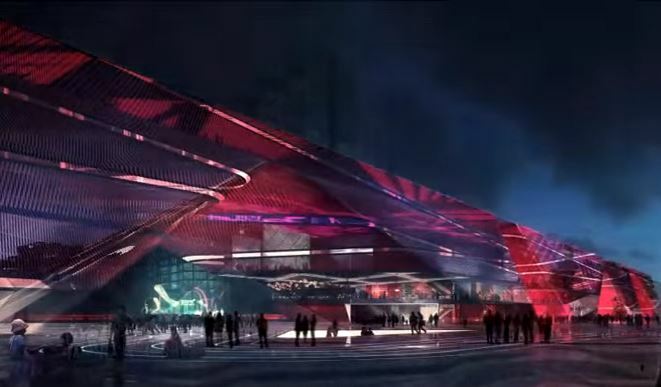 Cultural complex of 95,000 m2 with public art museum (13,500 m2), science museum (10,000 m2), youth centre (8,000 m2), retail (7,000 m2) and a bookshop (39,000 m2) and 31,500 m2 of underground parking and a new public square totalling 3.8 hectares. Building: 400m long, 50m wide, 25m high. The elongated building is an urban connector, and triggers – instead of hinders – a connection between the surrounding areas. Large arched passageways between adjacent volumes correspond with pathways on the western side and with infrastructure from a new business district on the eastern side. The round forms of the copper facade support the natural flow of passers-by through the area. By sharing the same form, height and material, the volumes unite as a visually cohesive whole without an apparent front or back facade. The fluid forms of the four volumes channel air currents in a natural way. Visitors and passers-by can shelter from the rain or sun of the local subtropical climate underneath the arches. The entrances to the cultural centres are located at these covered squares, which allow the various interior programmes to extend outdoors. The public appeal generated by this project makes Longcheng Plaza part of a new, vibrant city centre with the cultural complex as a landmark.